Yes, it’s another Wednesday post. That makes two in a row. So what’s so special today? 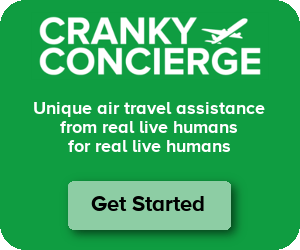 I’m happy to announce that Cranky Concierge is partnering with Momaboard to help traveling families with what is inevitably a very difficult experience . . . traveling with kids. No, we can’t prevent the TSA from feeling up your child, but we can combine Cranky Concierge’s air travel expertise with Momaboard’s baby-savvy ways to help make life easier for traveling families. Momaboard’s founder Kaamna Bhojwani-Dhawan made her first child a world traveler while he was in diapers, but she found that getting good information was difficult. So, she created Momaboard and has been growing it as a resource for traveling parents ever since. Her city guides have some great information, so when she approached me about a concierge service specifically for families, I thought it was a great idea. If you’d like to learn more, head on over to crankyconcierge.com/familyplan for more. Kind of makes you think of the movie “A Christmas Carol”.